Now, months later, the district is gearing up to expand the program into the summer and is working on further developing the relationships between these organizations to continue allowing a cheap, alternative program for community members to earn their high school diplomas. The program is currently set on graduating 16 students at the conclusion of the winter session. Now going into the program’s third session, Cadero-Smith said not much has changed in the program — just the relationships between the organizations that put it on. 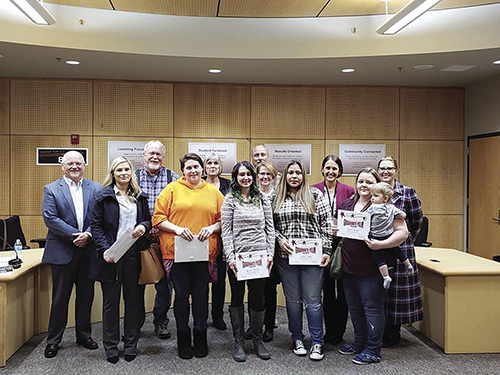 Yelm’s High School 21+ program is a part of the district’s larger “Graduate Yelm” initiative, which aims to promote a diversity of pathways for students looking to graduate. Through the High School 21+ program, students take courses to satisfy the graduation requisites to earn a high school diploma. Yelm’s program offers onsite daycare during class sessions. Cadero-Smith said she was able to attend one of the first sessions and speak with some of the students and their children at the daycare. While most of the students who attend the program are from Yelm, Cadero-Smith said they vary in walks of life. “They vary. We have students from their 20s up into their 40s,” she said. An information session for spring quarter classes will be held at 6 p.m. March 18 and 20 at the Yelm Extension School. Seat reservations can be found at spscc.edu and attendees are encouraged to bring either a high school transcript or prior employment history. Spring quarter classes are set to begin in April. The cost is $35 per quarter.